Biblical Hebrew classes in East Anglia: Norwich, Norfolk, Ipswich, Suffolk. In association with our correspondence course: "Biblical Hebrew made easy". Location: Bramerton Village Hall, Norwich (see map). 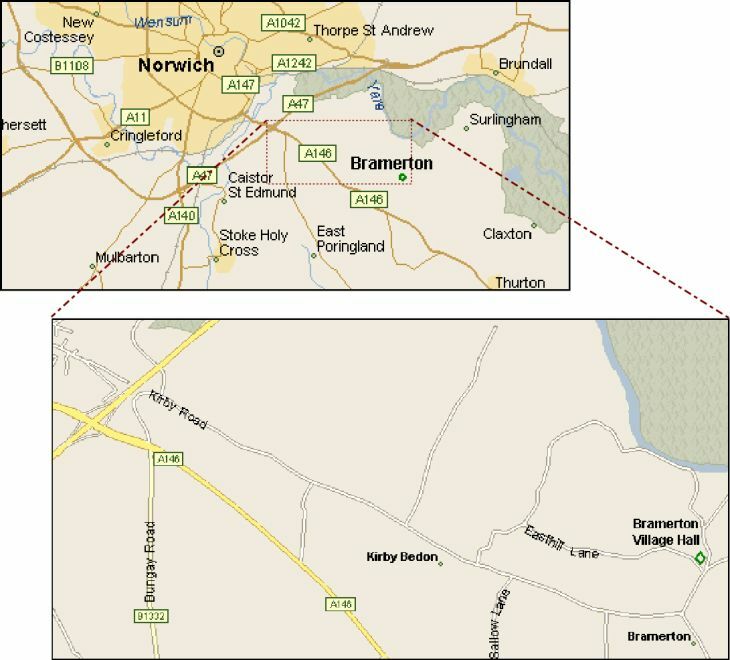 Bramerton is 5 minutes south of Norwich and easily accessible from the A146, A140, A47 etc if driving up from Suffolk areas. Covers the hall hire, all materials and handouts. Tapes will be available for missed sessions. We are happy to accept invitations to travel to any church or small group in order to conduct Hebrew tutorials or Hebrew introduction days. A fair charge would be levied plus travel costs. Please contact us. We will begin our Saturday class by examining texts from the Psalms. The existing Thursday class (which resumes in mid-May and can still take beginner or past students) is looking at Genesis, Exodus and Deuteronomy. To avoid overlap and so that you can attend both or either the Saturday class will mainly look at poetic and prophetic passages from the Psalms, Proverbs, Isaiah and the Minor Prophets. We will also look at how Hebrew can shed light on some New Testament passages. Combine an increased understanding of some of the most famous, meaningful and often difficult to understand passages in Scripture whilst being taught Hebrew . . . ever so slowly! Hebrew will bring these texts alive and add extra depth to your existing knowledge. Hebrew will be taught as we go whilst studying the Biblical texts. There'll be no grammar tables to learn! See how Hebrew thinking can change your world view. For instance, in Hebrew, faith and works are not at variance, beauty comes before function and rest before work. Man is more than a soul, the world and the flesh are good, whilst the heart is rotten and heaven is not a distant country only entered by angels! These statements are not meant to destroy traditional or evangelical thought but rather to challenge us to a more biblical theology, and in true Jewish style we will encourage debate. No prior knowledge of Hebrew or particular religious affiliation is required and the emphasis will be upon fun and learning, in other words, an inductive and interesting approach to deepening your biblical understanding. Each class will usually be independent of the last, so you can start anytime, and always do catch up via the tapes or self-study course.